Researchers at the National Center for Advancing Translational Sciences (NCATS) recently identified compounds that potentially can be used to inhibit Zika virus replication and reduce its ability to kill brain cells. These compounds now can be studied by the broader research community to help combat the Zika public health crisis. NCATS is part of the National Institutes of Health. Using NCATS' drug repurposing screening robots, researchers identified two classes of compounds effective against Zika: one is antiviral, and the other prevents Zika-related brain cell death. The compounds include emricasan, an investigational drug currently being evaluated in a clinical trial to reduce liver injury and fibrosis, and niclosamide, a U. S. Food and Drug Administration-approved drug for use in humans to treat worm infections. In addition, the researchers identified nine cyclin-dependent kinase (CDK) inhibitors. CDK usually is involved in regulation of cellular processes as well as normal brain development, but the Zika virus can negatively affect this process. NCATS' work was a collaborative effort with Johns Hopkins University, Baltimore, (JHU) and Florida State University, Tallahassee, (FSU), and the study results were published in the August 29 issue of Nature Medicine. The NCATS screening effort builds on the initial research by JHU and FSU scientists, who discovered that the Zika virus infects brain cells early in development. Infection by the Zika virus may be related to fetal microcephaly, an abnormally small head resulting from an underdeveloped and/or damaged brain. The Zika virus has been reported in 60 countries and territories worldwide; currently, there are no vaccines or effective drug treatments. The virus is spread primarily through bites from infected Aedes aegypti mosquitoes, and in addition, can be transmitted from mother to child and through sexual contact. It also is associated with neurological diseases such as Guillain-Barrée syndrome in infected adults. "The Zika virus poses a global health threat," said Anton Simeonov, Ph.D., NCATS scientific director. "While we await the development of effective vaccines, which can take a significant amount of time, our identification of repurposed small molecule compounds may accelerate the translational process of finding a potential therapy." These compounds were effective either in inhibiting the replication of Zika or in preventing the virus from killing brain cells. For example, emricasan prevents cell death, and niclosamide and the nine CDK inhibitors stop the virus' replication. The team also found that emricasan, when combined with one of the CDK inhibitors, prevented both cell death and virus replication. 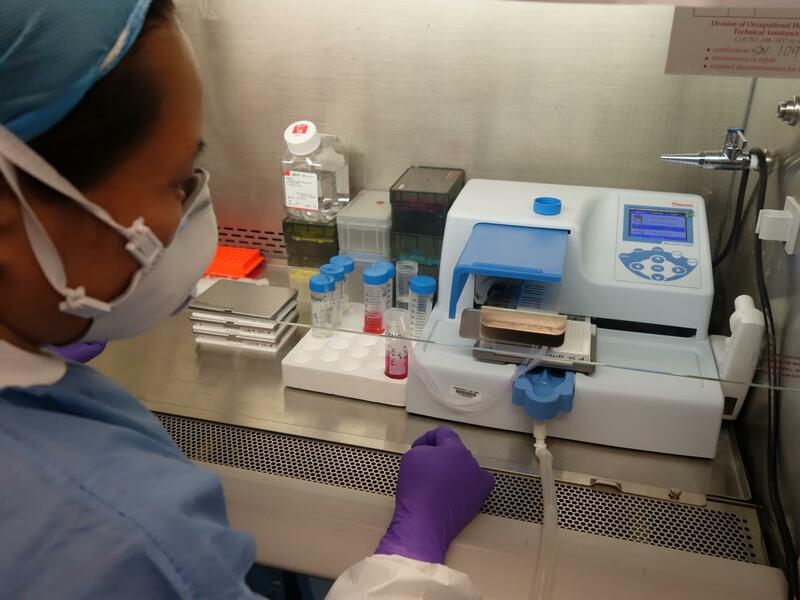 In addition, the team noted that the CDK inhibitors may be useful in treating non-pregnant patients who face an increased risk of Guillain-Barrée syndrome and other conditions sparked by Zika infection. "Using the NCATS drug repurposing platform for emerging infectious diseases can help rapidly identify potential treatments for urgent needs such as the Zika virus," Zheng said. "While identifying promising compounds is a first step, our goal at NCATS is to facilitate the translation of these findings for evaluation in the clinic. The release of all the compound screening data in this publication and in the public PubChem database opens the door to the research community to do just that." NCATS' screening effort enabled the broader research team to quickly translate their earlier discoveries toward work to develop treatments for Zika virus infection. JHU is working on a mouse model to study the neuroprotective effects of the compounds identified from the screen and studying the mechanism of action of the lead compounds. FSU is testing the efficacy of these compounds in a Zika virus mouse model and is also studying the mechanism of action of the lead compounds.